Lancaster Kennel Club - Should I Neuter? We suggest that you take this question seriously. There is only one reason to breed your pet - to improve the breed. If you are not active in showing or working your dog, think very carefully about your reason for breeding. Breeding should not be done so the kids can see puppies being born or because you want a puppy from your pet. You won't make money from breeding, so don't even try! Neutering your pet should be a standard practice. Reputable breedeers will generally recommend it, some will insist on it unless they enter into a co-owner contract with you. Remember that neutering will solve several problems. Your pet will be less likely to roam; aggression problems, especially in males, will be lessened; and there tend to be less health problems too. And accidents happen! Do you really want a litter of puppies to take care of? 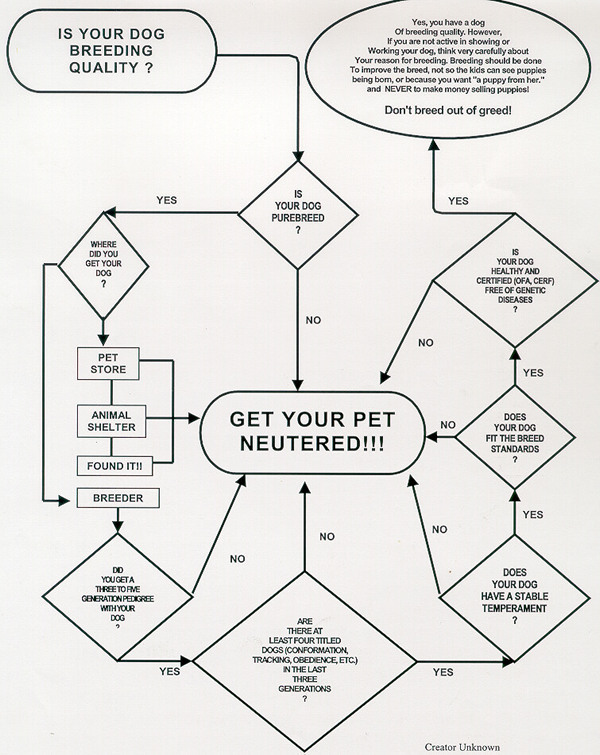 If you are thinking about breeding your pet, this chart will help you in deciding if it's the right thing to do.